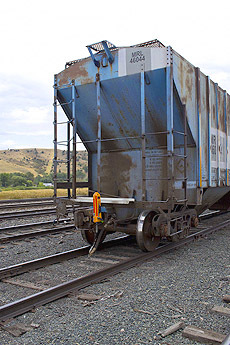 DPS Electronics in Bozeman, Montana designs and manufactures electronics for the railway industry, specializing in advanced solutions for head of train and end of train telemetry. Telemetry is the wireless communication of information from one place to another – in this case, from the end of a train to the front of a train. The DPS 2020-He ETD specifically monitors the train's brake line pressure and relays that and other critical information back to the locomotive making this unit an essential piece of equipment for the safe operation of a train. DPS is sensitive to the importance of railway electronics being well designed, easy to repair, reliable, safe and immune to environmental hazards, so they're very selective when determining the best materials to use for their equipment designs. Material selection for the 2020-HeETD was exceptionally important as it is constantly exposed to the elements and many other factors that can break down a poorly constructed unit – including extreme cold and vibration. Another factor critical to material selection was weight. 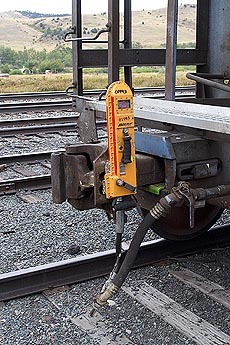 In some instances Carmen walks the length of the train carrying the end of train device to link it to the head of train device, so weight is a major safety issue. The original DPS 2020 was made from aluminum, when developing the new 2020-He ETD, DPS wanted something that would give them an even lighter unit that would match or exceed the durability of their old unit – they found both in IDI Composites' Structural Thermoset Composites. Structural Thermosets are high performance composites that are distinguished from standard sheet and bulk molding compounds (SMC and BMC) by the use of more specialized resins combined with higher levels of reinforcement (glass, carbon, aramid, etc.). The resulting fiber reinforced composite material satisfies unique performance requirements, which can improve the design, manufacture, and durability of a broad range of products. Many design engineers and molders have converted their product designs to Structural Thermoset SMC or Structural Thermoset BMC. Consisting of fiber-reinforced polymers with cross-linked molecules, these products offer a number of advantages over metals and thermoplastics, including higher strength per unit weight, better dimensional stability and corrosion resistance, greater design flexibility, and lower overall costs. When DPS Electronics reached out to IDI, to discuss appropriate solutions for the 2020-HeETD, it became quickly apparent that a standard SMC wouldn't meet their needs, and one of their stronger Structural Thermoset Composites was required. ST-2158 was tested and found to pass the physical requirements needed to stand up to the environment on the back of a train. Moreover, it was slightly less expensive to produce than the old aluminum unit, and gave DPS a faster lead-time over the competition. Additionally, IDI offered better field service, and the molded in color that a Structual Thermoset SMC offered saved costs and time instead of painting the unit. The 2020-He ETD is the only end of train unit on the market that is made from IDI's ST-2158, and the response from customers has been very positive. The lighter weight unit has made such an impact that some associates have taken to keeping it in their trucks just to ensure that they get to keep using it! "DPS Electronics is extremely satisfied with our decision to use Structural Thermosets for the DPS 2020-He ETD End of Train Device" states Susy Sands, director of sales at DPS Electronics. The DPS 2020-He ETD case has 102 drilled screw holes and 9 routed windows, making it a fairly complex shape, when asked about working with Structural Thermosets, she says "It was easy to work with, we found the material easy to drill and fairly flexible – while still providing the strength and durability we need." Based on their experience with ST-2158, DPS Electronics is considering using Structural Thermoset Composites for several more of their new products that need a lightweight and durable solution capable of performing in very harsh environments. IDI Composites Structural Thermosets are engineered for performance and will be up for the challenge when the time comes. DPS Electronics is a preferred supplier for Class I railroads as well as regional railways and shortlines. DPS prides itself on being true to its motto "Striving for a Better Way" by delivering high quality products at a fair price and superior Customer Service. DPS currently employs computer, electronics, mechanical and development engineers as well as administrative and technical support staff. DPS’s engineering staff uses the latest state of the art design tools.